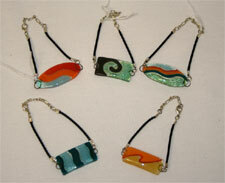 Fun and fashionable Zulu Grass Jewelry Gives the Gift of Opportunity! Each piece is handcrafted by the Maasai women of Kenya. The grass is dyed in rich hues and combined with Czech glass beads to create beautiful and fun jewelry! The making of this jewelry gives the Maasai women economic opportunity that is much needed. 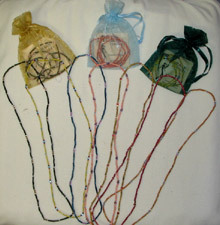 Each piece comes in a pretty organza pouch with information about the jewelry. Please order a minimum of 2 pieces. 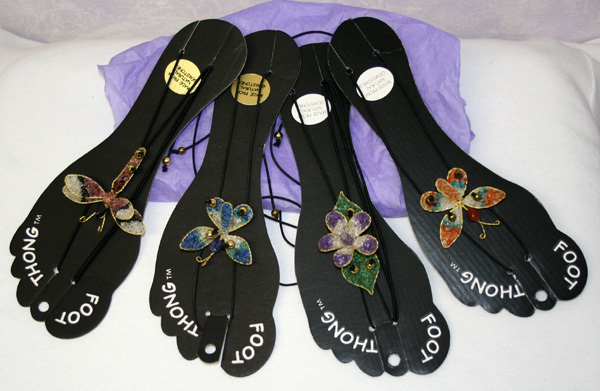 Foot Thongs are fun jewelry for your feet!!! Each adorable design is decorated with genuine semi precious stones!! Just Slip them onto your feet and you're ready to flaunt your footsies around town! Handmade in South Africa. Gorgeous headpieces handcrafted in India! 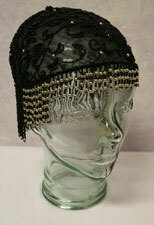 Great for a wedding, New Years Eve, or any fun night out on the town. Choose Long or Short. 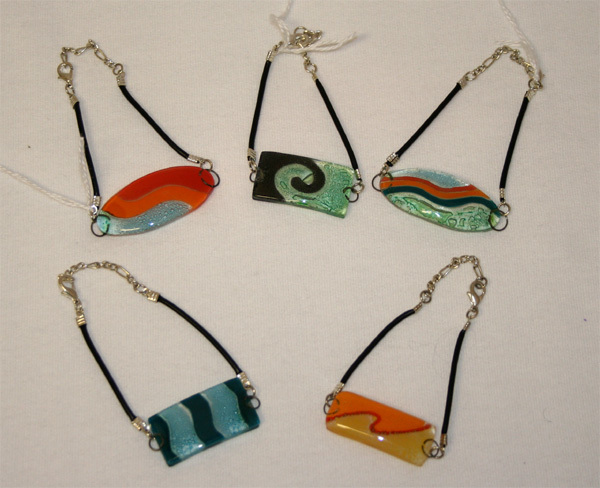 These Fair Trade Hand blown Glass Bracelets are a favorite of our younger customers, but add a splash of fun to the attire of all age groups!! Bracelets come on a leather cord with an adjustable lobster claw clasp. Better yet, these bracelets are made through The Fair Trade ensuring fair working conditions, and fair pay to the artists creating these bracelets. Made in Chile. Choose from assorted Orange, Blue, or Green. 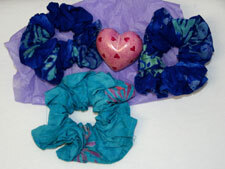 The nicest, most versatile hair piece we carry! 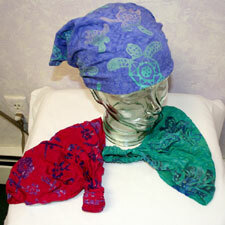 Hand batiked through a women's co-op in Indonesia, these vibrantly colored, rayon headbands can be worn in either the classic kerchief style, or scrunches up like a headband. The purchase us this item helps the families that make them to be self reliant, and to assure them their daily basic necessities. Give us a call if there is a particular color you would like to request! Made using the same materials and principals as our Eagle Ray Kerchiefs, these high quality handmade scrunchies are a pretty and practical way to dress your locks! Give us a call if there is a particular color you would like to request! Minimum order of two. Upavim is an organization that allows impoverished women from Guatemala to help themselves, their families, and their communities through the sales of their skilled crafts work. The communities in which these women live are plagued with illiteracy, unemployment, lack of affordable health care, alcoholism, malnutrition, and gun violence. These women are dedicated to helping to improve their communities through grants, donations, and profits from selling their crafts. Furthermore, they work with other women nearby to spread the empowerment. So far Upavim has established a medical and dental clinic, a medical lab, breast feeding promotion and children's growth monitoring program, scholarship ans tutoring project children's daycare, and a Montessori school. 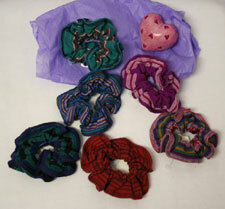 Your purchase of their beautiful crafts work, helps to further support their groundbreaking efforts. Upavim scrunchies are handmade, and skillfully woven in Guatemala. Give us a call if there is a particular color you would like to request! Minimum order of two.